FSM—This afternoon, Dr. Carina Hickling, a sexual health and reproduction specialist and consultant with UNFPA concluded an FSM wide series of workshops on clinical management for victims of sexual violence. According to the FSM Family Health and Safety Study of 2014, at least one in three women in the Federated States of Micronesia has experienced violence by a partner at least once in their life. The workshop was primarily intended for health practitioners but was also expanded to include community non-government organizations, women’s groups, church organizations and law enforcement agencies. Dr. Hickling conducted the workshop, which was designed to help the states to organize clinical management responses to sexual violence, in each of the four states. The workshops were organized by the state health departments, the FSM Department of Health and Social Affairs, and the United Nations Population Fund (UNFPA). Dr. Hickling said that as the seminars progress in each of the states, health practitioners in particular began to realize that they may have missed signs of sexual violence that present themselves in patients they have seen. She said that in each of the states, most health practitioners came to the conclusion that the problem was bigger than they had thought. The problem of sexual violence is already thought to affect a large portion of the population. The Family Health and Safety Study of 2014 says that as many as 40% of females between the ages of 15 and 24 have experienced sexual violence. Many victims do not come in for treatment or report instances of sexual violence for many reasons including social stigma and a feeling that reporting the crime wouldn’t accomplish anything. She stressed that victims of sexual violence should come in for treatment as soon as possible. She said that in far too many cases, victims come in after it is already too late to provide treatment. For instance, emergency contraception medicines are only effective up to five days after a sexual attack in order to prevent pregnancy. The workshop covered topics such as recognizing symptoms of victims of sexual violence and how to speak to a victim about what they may have experienced in non-judgmental and non-threatening ways. She covered topics of proper documentation for law enforcement referral and aspects of physical examination to treat and to preserve evidence of sexual violence. She also covered important related matters such as sexually transmitted infections, HIV, and pregnancy. The workshops themselves were on the first step toward developing an effective strategy to deal with victims of sexual violence. She said that systems of social support, legal processes, and interactions from civil societies all need to be formed. She said that governments, through working groups should establish standard operating procedures to help victims of sexual violence all the way from prevention to after care and law enforcement matters. She was encouraged that in each state, individual participants nominated themselves to set up sexual violence task forces with peer accountability in order to begin to develop effective strategies. 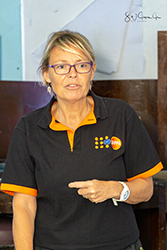 As UNFPA Global’s roving sexual and reproductive health consultant, Dr. Hickling provides technical assistance and oversight to UNFPA’s Humanitarian SRH programs in close collaboration with country and sector leads. She ensures quality of the program through compliance and adherence to UNFPA, Donor and National policies, procedures and guidelines, IAWG and the Sphere standards. She supports program teams, provides supervision, direction, coaching, mentoring and training based on capacity needs of staff. She develops UNFPA’s SRH programming models, tools and guidelines. She provides virtual SRHR, coaching and mentoring to country office staff. She supports and strengthens data collection forms and reporting such as HRP, MISP indicators, HMIS, and assesses staff capacity in technical and operational capacity to deliver quality SRH and GBV programs, providing formal and informal capacity building. Her missions today have included The Solomon Islands, Palestine including West Bank and the Gaza Strip, Federated States of Micronesia: Kosrae, Chuuk, Yap, Pohnpei. At the time of this writing she was on another mission in Budapest, Hungary. 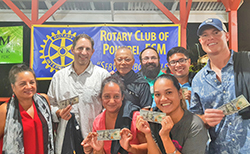 Pohnpei—The Pohnpei Rotary Club hosted its annual Quiz Night tonight at Cupid’s Restaurant. By all accounts, it was a rousing success. Six players at each of 22 tables competed for cash and prizes by trying to answer basically irrelevant and potentially pointless trivia questions. There was a lot of yelling and joking, and were it not for the efforts of the brave and selfless moderator the night might’ve descended into total anarchy. You are probably sorry now if you managed to miss it. 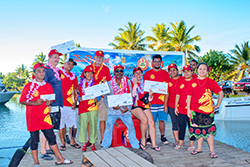 The top prize was $100 per person at the winning table provided by the Bank of Guam. This year the winners were Nathan Bonnice, Mellyann Mallarme, McClaine Gilmete, William Jon Dean, Mark Bush and John Fazio. Congratulations to those trivia buffs. In addition to the trivia competition there were raffles including a 50/50 raffle and a raffle for lots of goodies donated by our sponsors. There were also a few items for auction provided by donors that could be bid on and won. A highlight of the evening was the drawing for the raffle of two round trip United Airlines tickets to locations in Micronesia and Asia. That is a big win for a $5.00 ticket. There were 500 tickets sold. United pulled out the lucky tickets at quiz night and the lucky winners were Bernolina Hedson and Albert Carlot. Thank you, United Airlines, for the sponsorship. We want to thank all those in attendance for their generous support to all of the activities going on. For the Rotary Club this is our biggest fundraiser of the year. The Rotary Club in conjunction with Vital Petroleum awarded $21,600.00 in college scholarships for this school year, and Rotary also has a separate scholarship program where it awarded $12,000.00 in college scholarships this year. These scholarship programs are ongoing and a large portion of the money raised will go to those scholarship programs. We are also involved in many public service projects. Besides support for the Scripps National Spelling Bee, the Ipwetik Community Center in Madolenihmw, and the Pohnpei Swim Club; we sent sports equipment to Pingelap, provided portable Echocardiograph units to Pohnpei State to screen children for Rheumatic Heart Disease (RHD), helped to organize the visit of Taiko Japanese Drummers from Sendai, Japan, sponsored a water project at the Chuuk Women’s Council building and a solar power project at Sapwalap Elementary School; we also support Rotary International’s global effort to eradicate Polio. All in all we want to let people know the money you generously contribute is going to be well spent. We cannot do this type of fundraiser without support from a lot of sponsors. We want to thank all of our sponsors who made this evening a success listed in no particular order of importance. All the donors are extremely important. Thank you to one and all! We also want to thank the staff and management at Cupids for all their help in putting the event on, along with all the members of Rotary Club who put in extra effort beyond the call of duty to make this evening a success. All told the raffle, donations and quiz night itself raised over $12,000.00. It was a great evening and a beneficial one also. Thank you to everyone. Please purchase Rotary Club 2019 calendars, the proceeds of which also go towards our community projects. Parts of the Pacific Ocean are home to some of the world’s largest, most productive and valuable tuna fishing grounds. Under the management of the Western and Central Pacific Fisheries Commission (WCPFC), these waters contain the tropical tunas—bigeye, skipjack, and yellowfin—that are consumed in sandwiches, salads, and high-end sushi and sashimi. But without science-based, effective management measures, the health of these species could be in jeopardy. At this year’s WCPFC annual meeting 10-14 December in Honolulu, Hawaii, U.S., managers must work together to reinforce their commitment to sustainable tuna fisheries by taking three critical steps to ensure the long-term health of the species in these ocean waters and by reinforcing these actions with measures to end and prevent illegal fishing. Take steps to further develop harvest strategies. Harvest strategies, in which science-based models help set pre-agreed fishing limits that can fluctuate with the health of fisheries, are critical to modern fisheries management. While the WCPFC has made some progress on harvest strategies, which also take into account carefully considered objectives for the stocks, many vital details are still to be decided. At this year’s WCPFC meeting, managers should refine objectives for bigeye and yellowfin tuna and agree on a healthy target for South Pacific albacore. To help modernize its fisheries management approach, the WCPFC also should create a harvest strategy development working group to improve the dialogue between scientists and managers on the best way forward for each stock under Commission management. Reduce the impacts of fish aggregating devices. FADs—floating rafts that tuna gather around, making them easier targets for fishing vessels—are a major component of the purse seine fishery, which can scoop up huge amounts of tuna with each set of a net. Unfortunately, due to a lack of regulations, FAD use is unsustainable. The WCPFC’s FAD Working Group has recommended design guidelines for the devices to reduce the entanglement and deaths of sharks and turtles in FADs; the Commission must mandate that fleets adopt these designs as soon as possible. This would help the WCPFC catch up to other tuna regional fisheries management organizations that have adopted these standards. Because many FADs are not recovered from the ocean and thus contribute to the growing problem of marine debris, the WCPFC also should reduce the number of the devices that each vessel can have in the water at a time, phase out the use of plastic in FADs, and determine better ways to control and retrieve FADs before they break up and sink or wash onto coral reefs. Ensure the sustainability of bigeye tuna. According to this year’s updated stock assessment, bigeye tuna, or ahi, is not experiencing overfishing. But scientists have nonetheless advised against increasing fishing pressure. Because this valuable species needs to be managed for long-term sustainability, the WCPFC should accelerate efforts to develop a harvest strategy that would help promote responsible decision-making before bigeye are too depleted. In the meantime, the Commission should follow the scientific advice and take other steps to strengthen management by, for example, maintaining catch limits in the longline fishery and limiting how often purse seine vessels can set their nets on FADs, which would improve controls on managing bycatch of bigeye. Even if the WCPFC takes all the right steps on tuna management, the organization will be ineffective if it fails to adopt enforceable controls to end and prevent illegal, unreported, and unregulated (IUU) fishing. One proven way to minimize IUU fishing is to ensure that fishing vessels can be positively identified, specifically through International Maritime Organization (IMO) numbers, which stay with ships—regardless of changes in name, flag, or ownership—until they are scrapped. The WCPFC has made progress by requiring IMO numbers on vessels weighing 100 gross tons or more and by increasing compliance with that rule. Now, the Commission must continue to enforce the measure and ensure that IMO numbers are submitted with vessel records. The WCPFC should also expand the IMO number requirements to all motorized inboard fishing vessels 12 metres or longer that are authorized to operate outside the waters of their flag State. Improving the use of IMO numbers is only one factor in combating IUU fishing. As part of the WCPFC’s commitment to guard against the landing of illegally caught fish at ports, its members should designate one or more ports where suspected IUU vessels can be inspected. The Commission should also help small island developing States better fund the implementation of anti-IUU fishing measures in their ports. This year’s WCPFC agenda is packed with opportunities for better management of valuable tuna fisheries. If Commission members can set the right limits on fishing, better control fishing gear like FADs, and fight illegal fishing, the WCPFC can become a global leader of sustainable management. 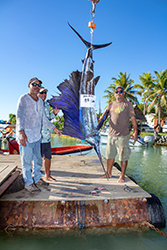 It is vital that decision makers take action at this meeting and demonstrate that they are serious about keeping Pacific tropical tunas healthy now and well into the future. Dave Gershman and Dawn Borg Costanzi are officers with The Pew Charitable Trusts’ global tuna conservation and ending illegal fishing campaigns, respectively. Palikir, Pohnpei—As a result of the Sixth Special Session of the Twentieth Congress of the Federated States of Micronesia, held this past November 13th to 17th, many programs, projects, and activities—both ongoing and new—will receive funding. While all funded projects, programs, and activities are worthy of reporting, a couple in particular may have the widest-range appeal. For example, the Congress has both approved and accepted a non-project grant from the Government of Japan in the amount of two hundred million Japanese Yen, which is equivalent to roughly 1.8 million United States Dollars, for the promotion of economic and social development programs. The result of mutual discussions on May 28th, 2018, between the FSM Department of Foreign Affairs and the Japanese Embassy in Kolonia, this is another extraordinary example of the friendship between our two nations. Meanwhile, the FSM Congress has also approved and accepted a grant in the amount of $85,000 from the United Nations’ Environment Programme to fund the “Renewal of Institutional Strengthening” that will, to quote Congressional Resolution No. 20-146, “…operate an effective and well organized National Ozone Unit (NOU) to support the country’s compliance with the control measures and other obligations under the Montreal Protocol….” Building our country’s refrigeration and air-conditioning servicing technicians’ capacity under the HCFC Phase-out Management Plan is another component of the grant, which emphasizes our country’s dedication to identifying and fighting climate change. Many more programs, projects, and activities were approved and/or accepted by the FSM Congress, including $250,000 from the United States’ Department of Health and Human Services to assist our nation in the Opioid State Targeted Response Project. To learn more about these recent resolutions, and more, citizens may visit the Congress of the FSM website at http://cfsm.fm/. Tokyo, Japan—His Excellency Peter M. Christian, President of the Federated States of Micronesia, accompanied by the Honorable Speaker Wesley Simina and other members of the FSM Congress, the Honorable Speaker Innocenti Oneisom and other members of the Chuuk Legislature, and other members of the FSM Government, celebrated the 30th anniversary of formal FSM-Japan diplomatic relations at the Hotel New Ohtani on November 2nd, 2018. Attended by over 800 participants, including distinguished leaders in the Japanese Government and private sector, including the Honorable Masanao Ozaki, Governor of Kochi Prefecture, Madam Akie Abe, wife of Prime Minister Shinzo Abe, the Honorable Keiji Furuya, House Representative and Chairman of the Japan-FSM Parliamentary Friendship League, the Honorable Mikio Shimoji, House Representative, the Honorable Toshiko Abe, State Minister of Foreign Affairs, the Honorable Yoshiro Mori, and more, the event was widely regarded as one of, if not the, largest celebration of diplomatic relations the FSM has ever had. “Ladies and gentlemen,” the President said, “as we celebrate the diplomatic relations that were formalized 30 years ago, I would like to point out that the history of our relations stretches more than 100 years—starting when people from Japan traveled further from their shores in search of opportunities, both in business and in romance.” The President remarked that he was happy that so many in attendance were a testament to the people-to-people interchange that began so many decades prior. 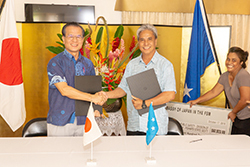 “In this modern day of metropolises, jet planes, and super trains, we have been able to continue these wonderful people-to-people programs, under the leadership of Mori sensei and the Parliamentary Friendship League, and which I hope will continue under the new relationship of Micronesia and the Prefectural Governments of Japan,” President Christian said, with a special thanks to Governor Ozaki of Kochi Prefecture for his leadership in this area. During the Meiji era, when the Japanese first began settling in the FSM, a Japanese businessman named Mori Koben established trade between Japan and our islands. There are over 2,000 of Mori’s descendants in the FSM today, and approximately 20% of the FSM’s population is of Japanese descent. Citizens can witness Japanese assistance in many forms on our islands, from the volunteers in our schools and departments of education to infrastructural projects such as gymnasiums. It was in no small part due to assistance from Japanese Overseas Cooperation Volunteers that Nan Madol received grant aid and support as it became registered as a UNESCO World Heritage Site. President Christian concluded his speech by saying “One weakness of man is to not acknowledge that which we don’t know, and to never give up a position of great esteem and power to those who could carry on. I take this festive occasion to humbly declare the people of Micronesia’s very best wishes and acknowledgement to His Majesty, Emperor of Japan upon his personal decision to abdicate his role as Emperor.” His Majesty, the Emperor of Japan, plans to abdicate his throne in April 2019. In addition to the formal celebration of the FSM-Japan 30th Anniversary of diplomatic relations on November 2nd, President Christian also had the opportunity to meet with Prime Minister Shinzo Abe. The meeting included discussions on issues of mutual interest to the FSM and Japan, including regional security and cooperation. The Government of the Federated States of Micronesia is proud of our long history with the Government of Japan, and will endeavor to ensure that the relationship between our two countries remains close, friendly, and supportive. Pohnpei, FSM –National practitioners in the Federated States of Micronesia working on the front line of climate change and disaster management have completed a capacity building training course in Pohnpei, boosting their monitoring and evaluation (M&E) skills and strengthening the nation’s ability to meet future climate challenges. Palikir, Pohnpei—The Twentieth Congress of the Federated States of Micronesia held its Sixth Special Session this past November 13th to 17th, and citizens will be interested to know that many of the nominees for membership in various governing boards were confirmed. Always and increasingly important to the sustainability of our nation, the National Oceanic Resource Management Authority (NORMA) will now enjoy the leadership and support of Mr. Grilly Jack, representing the FSM National Government, and Mr. Nena William, representing the State of Kosrae. MiCare will see Dr. Elizabeth Iehsi Keller on its Board of Directors representing the State of Pohnpei, while Dr. Tulensru E. Waguk will serve as a member of the Board of Regents for the College of Micronesia, representing the State of Kosrae. Mr. Justo Lokopwe has been confirmed to serve as the FSM National Election Commissioner for Chuuk State. Meanwhile, the FSM Telecommunication Regulation Authority will be served by Mr. Mathias Lawrence. 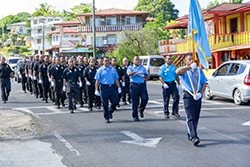 The Government of the Federated States of Micronesia sends its best wishes to these men and women as they endeavor to serve our nation and its citizens by serving the organizations they’re a part of. Citizens unfamiliar with governing boards and their functions may appreciate the following explanation. A Board of Regents, such as the College of Micronesia’s, is a committee nominated by the President of the Federated States of Micronesia and confirmed by the Congress of the Federated States of Micronesia to supervise and oversee the general welfare of the campus and the conduct of its staff and students. Similarly the Board of Directors for MiCare, the policy-making body of the institution, is also comprised of individuals nominated by the President and confirmed by the Congress. 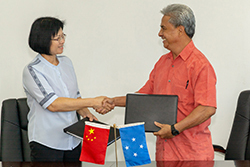 Suva, FIJI – The tourism industries of SPTO member countries will benefit from the Belt & Road Initiative (BRI) through the promotion of the China Pacific Tourism Year 2019 (CPTY). This was announced by President Xi Jinping on Friday when he met with Pacific Island Country Leaders from Niue, Samoa, Tonga, Fiji, PNG, Cook Islands, FSM and Vanuatu, before the Asia-Pacific Economic Cooperation (APEC). Pohnpei Office of the Public Auditor (POPA) Senior Auditor has successfully completed the SAI Young Leaders Program which was held in Washington DC on October 15 to October 26, 2018. This competitive program was launched by International Organization of Supreme Audit Institutions (INTOSAI) in 2017 with the objective of changing young leaders contributing to positive change in the Supreme Audit Institutions (SAI). SAI Leadership is widely recognized in the INTOSAI community as the most effective moving force, which transforms an SAI. Supporting SAIs in sustainably enhancing capacities and performance is impossible without SAI leadership driving positive change. Recognizing the significance of leadership development, the IDI launched the SAI YOUNG LEADERS Program, as a part of its portfolio programs. The program aims to nurture young leaders in SAIs, to enable their own growth and contribute to development of their SAIs. INTOSAI operates as an umbrella organization for the external government audit community. For more than 50 years it has provided an institutionalized framework for supreme audit institutions to promote development and transfer of knowledge, improve government auditing worldwide and enhance professional capacities, standing and influence of member SAIs in their respective countries. INTOSAI is an autonomous, independent and non-political organization. It is a non-governmental organization with special consultative status with the Economic and Social Council (ECOSOC) of the United Nations. INTOSAI was founded in 1953 at the initiative of Emilio Fernandez Camus, then President of the SAI of Cuba. At that time, 34 SAIs met for the 1st INTOSAI Congress in Cuba. At present INTOSAI has 194 Full Members, 5 Associate Members and 1 Affiliate Member. 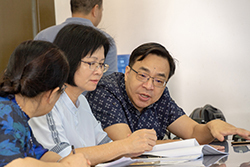 The INTOSAI Development Initiative (IDI) supports the enhancement of audit capacities of INTOSAI members. Activities include the long-term regional training programs, regional satellite and partnership programs as well as IDI training seminars and workshops in key areas of government auditing. IDI was established at the 1986 Sydney Congress. 91 SAIs in the INTOSAI community have indicated interest in the SAI Young Leaders (SYL) Program. The IDI sent an invitation to all SAIs that have indicated an interest to apply for the program in September 2017. IDI received 70 completed applications in October 2017. Applications received were screened using three broad parameters – the quality and potential of the change strategy proposal, the potential of the SYL to meet the program’s requirements, SAI commitment and assurance from Head of SAI. Based on the screening, 40 SAI YOUNG LEADERS including their respective change strategy proposals were selected for the second screening workshop which was held Norway on November 20-24, 2017. Cherry (although one of the 40 SYL selected) was not able to go to Norway because of visa requirement however, IDI contacted her and arranged for a panel interview via skype and gave her a chance to present her change strategy proposal which is Communication Strategy for POPA. After the second screening, 25 final young leader applicants including Cherry were invited to attend an International interaction workshop in Chennai, India on March 19-29, 2018. The other 24 SYLs came from Argentina, Bhutan, Botswana, China, Cook Islands, Costa Rica, Ecuador, Estonia, Fiji, Finland, India, Liberia, Maldives, Malta, Samoa, South Africa, Thailand, Tonga and Zambia. The SYLs and their respective coaches attended the International Interaction in Chennai, India. The workshop consists of theory, experience sharing and application sessions on various topics included in the four clusters – Discover Self, Discover Universe, Grow People and Create Value. SYLs were taught about being a leader; being aware of oneself not only through strength but also recognizing and improving on one’s weaknesses and limitations. Aside from self-awareness, SYLs also learned the importance of being socially aware, so as a leader SYL would know how to deal with conflict, how to influence others, how to collaborate and most especially how to empower others. The workshop also covered coaching skills and different kinds of learning styles all of which would support the SYLs. Of the 25 SYLs accepted to the program, 20 of them were successfully achieve the agreed change strategy project milestones and were invited to the second two-week workshop in Washington DC from October 15-26, 2018. In this workshop, SYLs learned about communicating effectively, influencing skills, managing conflict, negotiation skills creative thinking and further sessions on the four clusters (Discover Self, Discover Universe, Grow People and Create Value). SYLs also had the opportunity to visit such international organizations like United Nations Headquarter in New York and World Bank in Washington DC, to interact with international stakeholders on emerging issues. The second week of the workshop was hosted by the US Government Accountability Office (GAO). The SAI Young Leaders were given 30 minutes to present the milestones of their change strategies and their journey as SYL. Ms. Somcio’s strategy proposal for POPA is Communication strategy with the objective of promoting the value and benefits of Public Auditor’s Office to different stakeholders especially to Pohnpei citizens. One of the positive impact of POPA’s communication strategy is that there is increased number of audit requests and queries to our office. In our Annual Audit Plan for fiscal year 2019, seven (7) of the eight (8) audits scheduled came from different stakeholder’s request such as Legislature, Director of Treasury and from the Attorney General’s Office. Compliance Investigation Division also received request from Youth Sector to do presentation on Fraud Awareness for young people. Ms. Cherry Lyn (or Cheng to her friends) encourages Young Leaders from SAI of the Federated of Micronesia to apply and be a part of the next batch of SAI Young Leaders. Each year, the U.S. spends millions of dollars on Search and Rescue (SAR) missions throughout Micronesia. They have advised the governments of these islands to improve their small craft regulations to include some forms of emergency equipment such as a large bright colored tarp, radar reflectors, or ideally carry an emergency beacon called an EPIRB or PLB. Two years ago, Pacific Mission Aviation (PMA) was involved in a successful Sea Search operation where they found a skiff which had been adrift for 36 hours. They were able to relay the coordinates to the Coast Guard who later came and picked up the four men from Fais Island. That event started a quest to somehow help these islands have access to a Personal Locator Beacon (PLB) which they could take with them on voyages to other islands or when they went out fishing. Each PLB costs about $290.00, so it would require some kind of grant to acquire enough PLB’s for all the 18 inhabited Islands in Yap State alone. 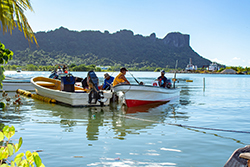 Yap State used to have a vessel that made quarterly trips through the islands to distribute food, people and supplies. But due to mechanical problems and ultimately a decision to send that ship to drydock, Yap has not had a reliable means of supporting their islands for over two years. Occasionally the National ship will make a trip through the islands, but it is not enough to meet the demand. At the end of 2017, in an effort to meet the needs of the people, PMA began a feeding program to supply the islands with rice. 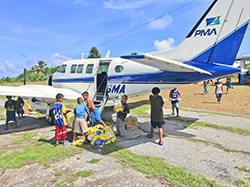 Whenever there is a flight to Ulithi and Fais that has any space available, PMA will fill the remaining space with sacks of 20 lb Rice. PMA donates the freight costs so that the people on the receiving end can purchase the rice for essentially the same price as they would buy it on the mainland. Here’s how it works. The Rice is purchased in bulk quantities of 100 bags at a time and receives a 10% discount which brings the price down to around $8.00 per bag. The Rice is then sold at $10.00 and for every sack sold, $2.00 goes towards funding the PLB project. Since January 2018, these $2.00 per sack have raised enough to purchase 18 PLB’s. This is enough for each inhabited island in Yap State to get one PLB each. PMA has also been able to purchase a small Pelican case to keep each PLB dry and protected. Each PLB has been registered online and will be assigned to responsible individual who has access to a HF radio. The requirement for a fisherman to take the PLB with him will be to only sign his name on a check-out sheet. In the event of an actual emergency, the beacon will send its location via satellite to the SAR authorities who will contact us and verify that this is an actual emergency. As soon as it is confirmed, the exact coordinates of the boat will be given and Search and Rescue can commence with less time spent on searching. We are excited to get these beacons distributed to the islands and will continue to purchase more so that the islands can have more than one beacon. 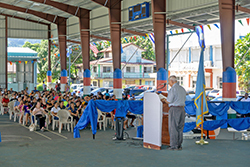 Pohnpei,FSM—The Honorable Yosiwo P. George, Vice President of the Federated States of Micronesia (FSM), delivered the opening remarks at the 32nd FSM Independence Day held at the FSM-China Friendship Gym in the Spanish Wall Park on November 3rd, 2018. His remark expounded on the message of Unity as a central theme of this year’s Independence Day. Peace, Unity, Liberty is the motto on the FSM seal. Acknowledging his friends and colleagues over the years, Vice President George said “Let me recognize the first Speaker of FSM Congress, the Honorable Bethwel Henry and the Honorable Olter Paul, former Congressman for Kitti/Madolehnimw and a dentist for Pohnpei State Government; both whom are still alive today,” Vice President George thanked both of them for their commitment and contribution to our Nation Building. 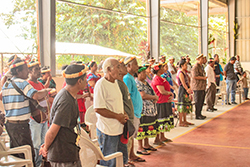 After the delivery of his opening statement, Vice President George, his wife Antelise, and Mr. Herman Semes, Jr., Special Assistant to the Office of the President, attended the Pwudoi Wahu in Kitti Municipality. 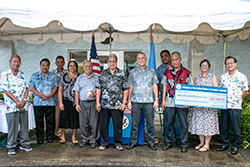 Pohnpei—This morning, Nan Madol, Pohnpei’s World Heritage site, one of the foundations of Pohnpei culture was the focus of two large grants provided by the United States government during a ceremony at the US Embassy in Nett. The grants are intended to help to preserve both the physical structure of Nan Madol, which is on the list of World Heritage sites in danger, and the cultural preservation of the site. Due to a delay in flights that meant missed connections, the representative for the largest grant recipient, Cultural Site Research and Management Foundation (https://www.csrmfoundation.org/), Mr. Douglas Comer was unable to join in the event. The US Embassy awarded CSRM with a $375,000 grant to aid in removing Nan Madol from the list of World Heritage Sites in Danger. 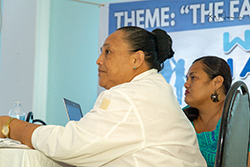 FSM—Tuesday was a huge election day in Yap, Kosrae, the United States, and in Guam. Guam’s voters made history when they overwhelmingly elected Lou Leon Guerrero as their Governor over incumbent Ray Tenorio. She will be Guam’s first female Governor. Additionally, not only did voters give Democrats a “super majority” in the 35th Guam Legislature, they also chose women to fill 10 of the Legislature’s 15 seats. The United States had its mid-term elections. Voters there put Democrats in control of the House of Representatives but chose to leave the Senate in the hands of the Republicans. At press time, not all of the ballots were yet in for the election in Yap. The Gubernatorial race is currently too close to call. Only the candidates who ran unopposed can be said with any certainty to have won. Those are Jerry G. Fagolimul for Election District 4 and Joseph B. Tiucheimal for Election District 5. In the other Election Districts, there are some widely spread vote numbers that might on the face of things seem to rule out a few of the candidates, but that cannot be determined with any degree of certainty until all of the ballots are in. Currently Nicholas Figirlaarwon is a strong front runner in the Yap State Legislature Election District 1 with 1156 votes. John Mafel, with 1009 votes is also leading the pack. Theodore (Ted) Rutun is currently in third place with 968 votes followed shortly behind by Vincent A. Figir with 931. Right behind is Kensley Ikosia with 904 votes, followed by Joseph Giliko with 871. The next vote getter was off the last seat votes by only 100 votes, and votes fall off further beyond that point. Unless the off island ballots significantly change things, it appears that in Election District 2, Jesse Raglmar-Subolmar is the winner with 106 votes over his opponent’s 25. The Election District 3 race is too tight to call. Front runners John Masiwemai and Mathew Haleyaluw are separated by only nine votes, with 95 and 86 respectively. With Kosrae’s radio station out of commission, they turned to a special Facebook group to distribute election results. The group requires membership which they wrote that they would approve if a person who requests it has a clearly Kosraen name. As a result, information has been difficult to come by for anyone else. However, Kosrae’s Chief of Staff, Nena William provided unofficial results as of today with the understanding that confined votes and absentee ballots have yet to be received and recorded. Numbers will necessarily change after those ballots are received. Ballots currently received show that candidates for Governor, Alik L. Alik and Carson K. Sigrah are separated by only 122 votes with Alik in the lead with 1352 votes. Currently Arthy G. Nena is the front runner for the seat of Lt. Governor with 1105 votes, 315 votes above his closest follower, Renster P. Andrew, who leads Aliksa B. Aliksa by 92 votes on today’s unofficial results. 10 candidates ran for five available seats to represent Lelu. The numbers in that race are pretty tightly packed. Currently, Tulensa W. Palik is in the lead with 596 votes, followed by Salpasr Tilfas with 528. The numbers group fairly tightly for the candidates with fewer votes. The following two leading candidates are separated by only two votes. Seven candidates ran for the three seats in Malem. With 279 votes, Charlton M. Timothy is the current front runner there, followed by Jarinson M. Charley, and Sasaky L. George with 251 and 239 votes respectively. Utwe has two seats available. Six candidates ran. The top three candidates are separated by only 26 votes according to today’s unofficial and non-final results. Numbers of votes for the other three candidates fall off sharply from the front runners, Yamado A. Melander, Andrew J. Andrew, and Josaiah F. Waguk. Tafunsak has four seats. Six candidates ran. The front runner, with 620 votes is currently Nena C. Ned. Two candidates are currently tied at 485 votes each, Rolner L. Joe and Harry H. Jackson. They are followed close behind by Alokoa J. Sigrah with 482 votes. The bottom two vote getters aren’t far behind, and all of this could change by the time the final ballots are in. Developing a continued educational outreach program to train a skilled local workforce that will assist in future conservation efforts; and Implementing a plan for continued monitoring of the endangered cultural heritage. “Evidence-based decision making, which relies on geophysical and remote sensing studies, will inform the development of conservation strategies and will be instrumental in the formulation of a comprehensive tourism strategy, which has been suggested by ICOMOS (International Council on Monuments and Sites) as a measure necessary for the removal of Nan Madol from the List of World Heritage in Danger,” their grant application said.ontinued monitoring of the endangered cultural heritage. Students from the College of Micronesia FSM came to the ceremony by the bus load. COM-FSM received a $40,000 grant for COM’s “Filming Our Journeys” project in conjunction with the U.S. Ambassador’s Fund for Cultural Preservation award to conserve the World Heritage site Nan Madol. 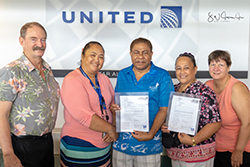 “Through this award, students will receive training in storytelling and in digital storytelling techniques to empower them to create films and other media that interpret and promote Nan Madol and other sites of cultural heritage in the Federated States of Micronesia,” the grant application said. 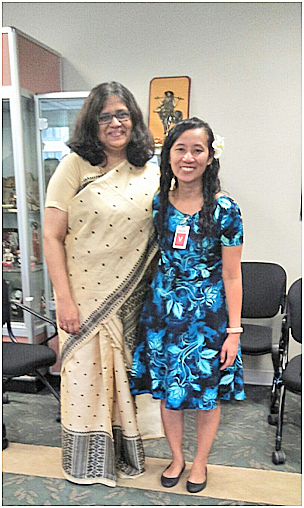 “Additional elements of this program will connect Micronesian students to interpreters and conservators of other imperiled cultural heritage in the United States. Funds from this grant will be used to support the College of Micronesia’s continued work with students engaged in preserving and recording the nation’s history. This includes further training in storytelling techniques as well as technical training in filmmaking, podcasting, and/or other digital storytelling or imaging technologies,” the successful grant application said. The Honorable Yosiwo P. George, Vice President of the FSM, met with Dr. Kshatrapati Shivaji, Asian Development Bank’s (ADB) Executive Director representing the countries of Afghanistan, Bangladesh, Bhutan, India, Lao People’s Democratic Republic, Tajikistan, and Turkmenistan. Dr. Shivaji sits on the Executive Board of ADB as the Dean by serving the longest tenure among all seven (7) Executive Board members. The purpose of the meeting was to pay a courtesy call to Vice President George and to provide an update to the Government of the FSM on ADB projects, activities, and events in this new fiscal year. Vice President George thanked ADB, through Dr. Shivaji, for its many years of assistance to the FSM. Dr. Shivaji also thanked the Vice President and asked that he convey the good news to His Excellency, President Peter M. Christian, that ADB is doubling its country allocation from $6M to $12M annually. Consistent with the tone of strengthening FSM’s relationship with ADB, other important issues discussed included a new ADB Office to be set up in Pohnpei, which is aimed to foster dialogue between ADB and FSM. Also discussed was the new Executive Order designating the Vice President as the NDA tasked to coordinate all projects with multilateral partners, including the flow of information between these entities and the Government. As such, the coordination of all ADB funded projects—including the Improving the Quality of Basic Education (IQBE) project with FSM Department of Education—the Public Service Reform Project, and all other projects in the ADB pipeline will be subjected to the Vice President’s review. Dr. Shivaji is the highest ADB Official to visit the FSM from during the week of October 22nd-25tth, 2018. Aside from meeting with Vice President George, Dr. Shivaji also advised that he met with the Honorable Marcelo Peterson (Governor of Pohnpei State), His Excellency Robert Riley (US Ambassador to the FSM), His Excellency George Fraser (Australian Ambassador to the FSM), FSM Development Bank, Bank of the FSM, and the Small Business Guarantee Office in Pohnpei. Dr. Shivaji thanked Vice President George for receiving him and the kind words expressed. He assured Vice President George that he that he will speak with Director-General Carmela Locsin, who heads the Pacific Department (PARD) of ADB, to give priority to FSM’s needs. Vice President George thanked Dr. Shivaji for taking his time to meet with the stakeholders mentioned above. He further requested that ADB conducts measurable assessments on previous projects, such as the Early Retirement Project. While popular with the public and built with only the best intentions, the perception within the FSM National Government is that our country was not ready for such a program to be given the quality it deserves. The meeting ended on a positive note. Vice President George invited Dr. Shivaji to visit the other FSM States and also to visit Pohnpei more frequently. Dr. Shivaji thanked him and informed him that his next stop will be in Palau. Joining Vice President George and Dr. Shivaji during this meeting were Mr. Mason Albert, ADB’s Residence Representative and Mr. Herman Semes, Jr., Special Assistant to the President/the Vice President. Pohnpei—Japanese Ambassador to the FSM Ryoichi Horie presented a grant in the amount of $67,823 to the Pohnpei Department of Public Safety during a ceremony at the Ambassador’s residence the morning. The money will be used by the Division of Fire and Emergency Service to purchase a new four wheel drive ambulance for Pohnpei’s rural areas. During his remarks, Governor Marcelo Peterson thanked the government of Japan for its generous donation through the Grass Roots Program of the Japanese Embassy. He said that now that Pohnpei has trained medical responders, Pohnpei is trying to acquire more ambulances to better serve the people of Pohnpei. This one, he said, will likely be stationed in Madolenihmw so that if an medical emergency call comes in from Kitti or Madolenihmw it will be able to more quickly reach the patient in need of medical attention than if it was stationed in Kolonia. He said that the four wheel drive of the vehicle would be helpful on difficult to traverse roads. Patrick Carl, the Chief of the Division of Fire and Emergency Service said that the supplier will be able to get the new vehicle within two months of receipt of the purchase order which the state can now issue with the Japan’s donation. Director of the Department of Public Safety, Benito Cantero also thanked the Embassy of Japan and its staff members for the donation. He said that he was pleasantly surprised at how quickly the grant came together between the time of application and its being granted. Ambassador Horie said that the donation represented the strong relationship between the people of Pohnpei and Japan. He said that he is proud to be able to facilitate the donation of the vessel for the protection of Pohnpei’s people. After the formalities were concluded Governor Peterson asked Chief Carl what yet needs to be done in order to establish the upcoming 911 emergency service line. Carl said that they are awaiting the installation of an antenna which might be done by as early as next week. He said that personnel have been trained on the system and all that needs to happen now is to have the antenna installed. When that is done they can begin to implement it. Governor Peterson said that one of the beauties of the 911 system is that anyone who needs it can use it and easily remember the number, even children who may be faced with an emergency. He said that announcement would be made when the system is up and ready for use. Japan’s money will be used to pay for the ambulance itself and for wharfage. Pohnpei—In Pohnpei’s not too distant past, Pohnpei black peppercorns were highly praised by gourmets for their distinctive spicy yet somewhat sweet taste. They had a high market value around the world. Only high quality pepper corns were selected for export which kept the market value high. It was sold only in high end outlets. Mistakes were made. 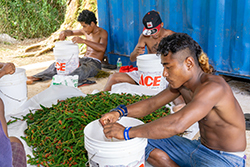 As a result, the once high market price fell due to inferior peppercorns that were introduced into the market stream that were also sold as Pohnpei pepper. Still distinctively Pohnpeian, the inferior product no longer attracted the attention of high end buyers, a market that had been painstakingly built. The market collapsed and it is now difficult to find the wonderful pepper that is distinctly Pohnpeian in western markets, even in large cities. 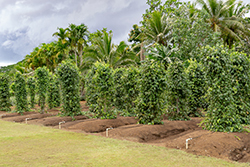 Pohnpei has several active growers of Pohnpei peppercorns. Some of them, along with other stake holders gathered this morning at the Island Food Community of Pohnpei facilities to hear a lecture by Dr. Virendra M. Verma, Project Director for an integrated research, outreach and education project entitled “Black pepper micro-propagation for elite seedling production: Comparison of local practices and commercial cultivation methods”. 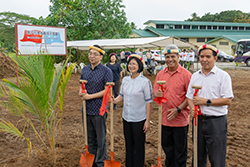 The project, conceived and proposed by Dr. Verma is approved and funded by the United States Department of Agriculture, National Institute of Food and Agriculture (USDA-NIFA) for Micronesia. The project was conceived in order to promote sustainable black pepper cultivation in the region. 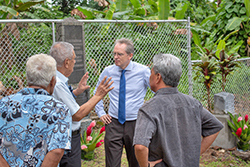 On the next day, at the Palikir Black Pepper Demonstration Plot just beyond the College of Micronesia FSM campus, he explained what he meant about the “shortage of tree ferns”. Local growers have been using short tree ferns to support the pepper plants but there aren’t many of them and not enough to sustain a local pepper crop. He has established 200 plants at the demonstration plot supported by tall concrete poles that were manufactured onsite. The plants are 13 feet tall. He says that height puts stress on the plants which causes them to generate more fruit than they would do if not under stress. Indeed, the plants at the plot from which peppercorns had not yet been harvested were overflowing with healthy peppercorns. He said that he reasonably expects to be able to continuously harvest from those pepper plants for 35 years, adding that each harvest out produces the harvest of 2000 plants on another local plantation. His goal and stated goal of the research project is to help local farmers to realize the same kind of production on their own plantations. 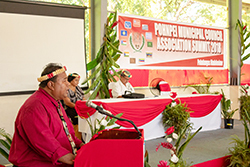 “This project is the first of its kind not only in the Micronesian region but also in the Pacific region because it is integrating and employing multiple latest tools and technologies such as plant biotechnology, horticulture, microbiology, plant physiology and plant pathology for sustainable, climate-smart and organic commercial cultivation of black pepper,” he wrote. He said that automatic fertilizer injectors keep the fertilizer application uniform. He spoke of soil pH level maintenance, climate-smart horticultural, plant physiological and integrated pest management practices and other topics that went completely over my head. He showed me the raised beds that were there in order to ensure perfect water drainage, organic soil amendment and other techniques to provide perfect nutrition. No matter what it all meant, I can attest that the fruit of the pepper plants was plentiful. But the proof in the pudding was when Dr. Verma rolled a slightly red berry between his fingers exposing the white peppercorn beneath and handed it to me. He told me to crunch it between my teeth until it was a fine powder. It was good. No, good isn’t good enough. It was incredible. Even though we only use Pohnpei black pepper in a grinder in our house, it was still the most incredible tasting peppercorn I have ever tasted. It was hot, with a sweet after taste. It was perfect. Dr. Verma said that the demonstration farm has been commercially sustainable during its two years of operation. He added that the current value of the crop on a wholesale basis is about $100 per pound. “Adoption of new practices such as micro-propagation of black pepper for improved and enhanced productivity will ultimately help in reviving the local black pepper industry. Furthermore, this project will provide opportunities for income generation and profitable self-employment to the participating farmers,” he said. 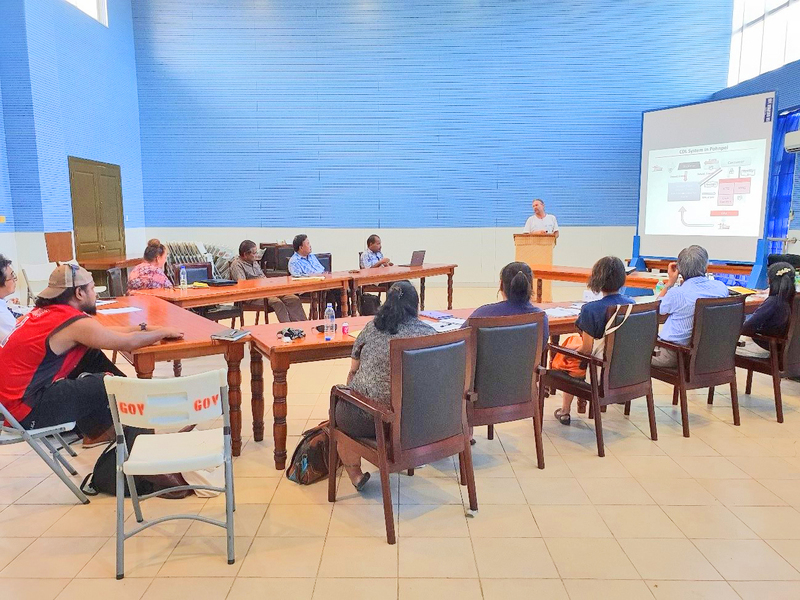 Tuesday’s seminar was organized by the Pohnpei Agriculture Department in collaboration with the College of Micronesia-FSM and Micronesia Land-grant Program. Various participants from Department of Resources and Economic Affairs, Pohnpei Farmers Association, Pohnpei Agriculture Department, College of Micronesia-FSM, Micronesia Land-grant program, Agricultural Experiment Station, Cooperative Extension Services, Pohnpei Island Food Community, black pepper producers and black pepper processors were in attendance. As stated in the bill, the development of a hotel with a casino, if done right, has potential to bring financial benefits and jobs to Pohnpei State. However, the current bill as written, does not show how many temporary (i.e. construction) and permanent (i.e. employees of the hotel and casino) jobs will be created from this project for Pohnpei’s residents. We feel the bill should be amended to require a minimum number of local employees to be hired by this establishment and to require a minimum number of local senior-level employees (i.e. managers, assistant managers, supervisors, etc.) who will make more than minimum wage, so we truly feel true benefits to our people? The bill also does not provide us with any sort of an estimate of what the potential financial benefits are going to be in terms of fees and taxes to Pohnpei State. We feel it is incumbent on Pohnpei State to make their case to Pohnpei’s residents by providing a comprehensive assessment which will show the minimum amounts of jobs and financial benefits Pohnpei State is willing to cope with in order for this venture to make a major difference in our economy. Simply passing a law without setting some concrete parameters and educated and/or minimum estimates on the benefits we wish to gain from such major decision is irresponsible. There must be a cost benefit analysis (financial/economic benefits versus environmental, health, social and cultural risks and implications) so we know what we are gaining against what we are losing to help us decide if this is the course we wish to take. And as we stated during the hearing, the bill also does not include any provisions on money-laundering, fraud, prostitution and human trafficking. We feel the bill should be amended to include these provisions or if these are already in existing laws, the bill at least should allude to such laws. Gambling has the potential to bring fraudulent people and businesses to Pohnpei. And at the moment, Pohnpei State does not have the capacity to deal with such. The hotel and casino will require large provisions of our water resources and power from the Pohnpei Utilities Corporation (PUC). The Legislature needs to require the Governor and the Department of R&D to provide an assessment of how much water and power such establishment will require and how this will impact the availability of water and power resources to the residents of Pohnpei? And for the Governor and the Department of R&D to provide a comprehensive plan on how they will provide water and power to this company without compromising water and power resources to Pohnpei’s residents and other business establishments before this bill is taken under consideration. In other parts of the world where tourism has grown rapidly, including in Palau and in Bali Indonesia, the large number of visitors and their appetite for fish and other marine resources has caused declines in their fisheries and driven up the price of those resources to the point where most local residents can no longer afford them. For example, in Palau, the cost of mangrove crab is now at approximately $35/lb. And while this, in the short term, is a good thing for the local fishermen, many locals can no longer afford them. And when people can no longer afford their own natural resources, it leads them to eat more unhealthy imported proteins or foods. It is very important that this issue be taken into consideration, so we don’t lose our ability to eat our most healthy proteins like fish. If we lose our ability to eat our healthy local proteins this can exacerbate our non-communicable disease epidemic. As we are all aware, this epidemic is already costing Pohnpei a lot of money in medical expenses. Establishment of a hotel with a casino has potential to bring other large businesses. As I shared during my testimony this morning, the casino will bring a lot of people with lots of money who could potentially invest in Pohnpei. While this may be a good thing for our economy, it will also have environmental, health, social and cultural implications. And it will most certainly change our current strategy to develop sustainably. For this reason, we ask that there be a referendum on what direction the people of Pohnpei want. Do we want sustainable development as is stated in our current Pohnpei State Strategic Development Plan and the FSM National Sustainable Development Plan, or do we want to build Pohnpei into another Saipan and other places with big businesses, regardless of how it impacts our environment, health, culture and social welfare? Please note that we are not asking for a referendum on the hotel and casino, we are asking for a referendum on the future strategic direction of Pohnpei State and the FSM. FSM has signed off on several commitments with the United Nations, calling for sustainable development – establishing a large-scale hotel and casinos are in direct contrast to these commitments. The claim that Pohnpei needs a 200-room hotel and casinos so we can host large national, regional and international conferences may be a false assumption. Those traveling to Pohnpei for conferences and other eco-tourism activities may not necessarily want to check into a hotel with a casino. These may very well be two different sorts of clientele and may not necessarily want to associate with each other. There must be a tourism/visitor survey to see if people visiting Pohnpei for conferences, and to dive, surf and participate in eco or traditional tourism activities will actually want to check into a hotel with gamblers. Or if they are willing to visit an island with casinos and gambling – these are things we want to find out first. Also, a hotel with a casino may not want other guests who are not interested in gambling and spending money in their establishment stay with them. These are questions that must be answered before this bill can be considered. As I also stated in my testimony, climate change is an issue FSM and Pohnpei State are quite vocal about in the international community. If we are serious about climate change, we need to refrain from dredging reefs and destroying our natural protections (coral reefs and mangroves). Establishing a casino on a reef flat can be perceived by our regional partners and the international community that we are not do not believe in and are not serious about climate change and rising sea-levels. As we are all aware, rising sea levels, and the expected increased droughts and other climate change impacts such as typhoons will also impact the viability of the investment and physical infrastructure in the long term. People who are attracted to gambling are usually high rollers who are not sensitive to traditional cultures and customs. Are these the types of tourists we want to attract to our island? We feel this bill is premature. There are just too many unknowns for this bill to go through right now. In recent years, severe degradation of the coastal environment in FSM- including the cutting of mangroves, which can help reduce the effects of storm surges- has increased the vulnerability of the country’s coastal communities. When typhoon Maysak struck FSM in 2015, the storm destroyed hundreds of homes and 90 percent of crops and fruit trees in affected areas of Chuuk and Yap states, risking the lives and livelihoods of local residents dependent on agriculture, according to a 2015 U.S. Government damage assessment. To reduce the impacts of natural hazards, USAID’s Office of U.S. Foreign Disaster Assistance (USAID/OFDA) supports the American Red Cross and its partner the Micronesian Red Cross Society to implement the Micronesia Community Resilience and Capacity Development (CRCD) project, which includes community preparedness and coastal restoration activities in Chuuk. Since CRCD activities began in 2016, community members like Myuri Simi, a volunteer from a local women’s group in Chuuk, have successfully established seven nurseries and planted more than 11, 650 coconut, mangrove, and pandanus tree seedlings, beginning the restoration of the critical coastal green belt. USAID/OFDA support for the community engagement ensures FSM will be better prepared for future disasters by giving individuals the knowledge and opportunity to take action and build disaster resilience. Chuuk—The Japanese government provided a school bus at a cost of $31,380 to the St. Cecilia School in Chuuk. Japan’s Ambassador Ryoichi Horie handed over the keys to the school during a ceremony on September 25. The Grant Assistance for Grassroots Human Security Projects provided the funds to procure the bus which will be used to improve student attendance and to provide safety for students. In his address, His Excellency Ambassador Horie said that the school is important for the future and was glad to support the young lives of boys and girls. He added that he was impressed by the beautiful voices of the students when they sang. Ambassador Horie and Madam also sang some songs during the ceremony. Mr. Angelino Rosokow, Chief of Staff of Chuuk State Government expressed his deepest gratitude to Ambassador Horie and the people of Japan for their continuous support. The Honorable Jessie William, Representative of the House of Senate and Chairman of the Board St. Cecilia School and Rev. Rosendo Rudolph showed their genuine appreciation saying that the provided bus would allow all students to appear in school on time. Mr. Anselmo Daniel from the ODA Office also conveyed his sincere appreciation for the generous donation. 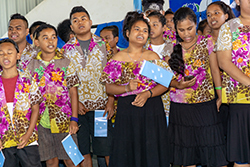 The ceremony was witnessed by the staff of Chuuk State Government and Chuuk ODA Office, the board members of St. Cecilia School, teachers, and students, along with Embassy staff members. training was to talk about the benefits and values of POPA in connection to fighting fraud and corruption. Youth-4-Change is partnering with POPA’s Compliance Investigation Division to build capacity and training for the youth in the area of public awareness and cultivating creativity against corruption, this includes composing songs, skits and music jams. The Anti-Corruption Project sponsored by the Pacific People Advancing Change (PPAC) small grants facility fund is administered by Youth-4-Change, a nonprofit organization. Youth- 4-Change is a youth group that trains young individuals to become peer educators and leaders in the Pohnpei Community. POPA is pleased to be teaming up with Youth-4-Change. Pohnpei—On October 22, Pohnpei Supreme Court Justice Joseph issued a search warrant on seven homes and offices. The warrant said that the Court is satisfied that probable cause exists to believe that ZJ Construction Co., Zaiger Sonden, Emerenciano Canama, and Jack Yakana conspired to engage in bid rigging and collusion to obtain contracts in favor of ZJ Construction Co. in violation of 61 PC 6.147, “Cheating”; in violation of 61 PC 6-141, “Grand Larceny.” Moreover, the Court found probable cause to believe that Emerenciano Canama’s and Jack Yakana’s conduct amounts to a violation of 61 PC 10- 112, “Misconduct in Public Office”. “Probable cause” does not mean that the men have been convicted of anything and are presumed to be innocent unless otherwise proven in a court of law. Yesterday the warrant was executed at the residential and business premises of Emerenciano Canama, the residential premises of Zaiger Sonden and his business office, “ZJ Construction Company”, the residence of Jack Yakana, and the Transportation and Infrastructure office where Canama and Yakana work or did work, and the Project Management Office of the Pohnpei Government. State police officers executed the warrant seizing personal and business records, document, computers, hard drives, flash drives, electronic data storage devices, emails, bank records, check book registers, passbook saving accounts, bank statements, business books and records, files and other documents related to 20 Pohnpei infrastructure projects. Additionally, officers arrested Sonden, Yakana and Canama based on arrest warrants issued by the Court. Though today was UN Day in the FSM, a national holiday, Associate Justice Nickontro Johnny held a hearing at just before 5:00 this evening. He released the defendants based on a surety and the surrender of their passports to the court. On October 11, based on an examination of the Office of Transportation and Infrastructure (T&I) by a Joint Investigative Team, the Pohnpei Office of the Public Auditor (OPA) issued a Management Advisory Report to Acting Administrator of T&I, Mr. Ricky Lebehn. The investigation team consisted of one representative from each of the Department of Public Safety, Office of the Attorney General and from the Compliance Investigation Division OPA. “The special review was brought on by allegations of impropriety with T&I bidding and awarding processes,” the letter said. The report informed Lebehn that of the total of 30 construction projects with an aggregate value of $1,180,030.16 awarded during FY 2017, 15 projects totaling $651,421.51 were awarded to ZJ Construction, a total of 50% of the contracts and 55 percent of the total project funds. The team selected an in-depth examination, including on-site visits of ten projects each with a contract value of $20,000 and higher. T&I had awarded all those contracts to ZJ Construction. The report said that a majority of contract files reviewed showed that the company was a non-responsive and non-responsible bidder. There were instances where contracts were awarded to ZJ Construction even though they were not the lowest responsible bidder. The company’s bids also often did not include a detail of its qualifications and other items usually required in bids. The report said there was an appearance of collusion, conflict of interest and mismanagement of the contract bidding and award process. It alleged that the State Government Architect exerted his influence to divert business to ZJ Construction. It alleged that he directly leaked information to his wife who worked as an Auto-CAD operator for the company. It implied that leak may have powered the bids that ZJ Construction submitted to T&I. Most of the bid proposals submitted by the company were within 10 percent of the government estimates and were also the closest in terms of quantity of materials when those quantities were not published in the invitations to bid. The report included photos and other information from their site visits to six of the reviewed infrastructure projects. At each of the sites it found examples of materials that were not the quality of materials that were bid, or items such as new doors required under the scope of work that were not provided at all, or work that was said to have been complete that did not work or did not last longer than one use, or overdue jobs that had barely even begun though they had long ago been scheduled for completion, or other discrepancies, or all of the above. The report made several recommendations to T&I in order to keep the problems they found in the bidding process from happening again. Madolenihmw, Pohnpei—Beginning on October 19, the Municipal Council Association held its third annual summit at the new gymnasium in Pohnlangas, Madolenihmw. During the next two days, council members from each of Pohnpei’s municipalities heard presentations on a variety of topics and participated in question and answer discussions. On the first day they had presentations on the security aspect of the Compact of Free Association with the United States by FSM’s Department of Foreign Affairs. Churchill Edward presented on behalf of the Department of Education, and Alexander Narruhn presented on FSM Social Security. On the next day they heard a presentation on the economic aspect of the Compact of Free Association, presented by Palikkun Kilafwasru. After the morning break they had a panel discussion on pre and post 2023, presented by the JCRP Committee. In the afternoon, that panel discussion continued from the viewpoint of Pohnpei and National leaders. Raise Your Text is a startup company whose primary product is a community development platform that reduces teacher absenteeism through an anonymous accountability model via mobile phones and email. Through a memorandum of understanding with Pohnpei Department of Education, Raise Your Text has been conducting a pilot of its program in Pohnpei schools which has—so far—seen statistically interesting results, where in elementary schools for example ~96.8% of Raise Your Text teachers have been present in the classroom compared with ~91.4% of non-pilot program teachers in all schools. At pilot elementary schools specifically, the attendance rates are 98.6% for pilot teachers versus 96.8% of non-pilot teachers at pilot schools. For all low accredited schools the rate Raise Your Text pilot teachers were present was 98% of the time, compared to 85.7% for non-pilot teachers. The first data report covers the first five weeks of the academic year. Presently funded exclusively by D-Prize through an entrepreneurial grant, their pilot will end on November 2nd and their funding will cease by December 1st. “It would be exciting to see if we can implement this in the FSM National Government itself,” said Special Assistant Herman Semes Jr, “at least to give us the data for leadership to see how absenteeism may have an impact on performance and cost to the National Government.” Such information may be very useful for our leaders to know. Pohnpei—As rain fell as it often does in Pohnpei, dozens of people witnessed the inauguration celebration of the rehabilitation project of the German Cemetery and Sokehs Mass Grave this afternoon. The ceremony took place at the site of the German Cemetery which is located behind the Kepinle Church. The project was funded by the Embassy of the Federal Republic of Germany in partnership with the Division of Historic Preservation, Department of Land, Pohnpei State Government and the Rotary Club of Pohnpei. 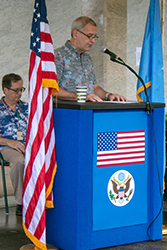 Augustine Kohler served as the Master of Ceremonies for the inauguration of the site. He said in both good and bad ways, the German Administration had an impact on Pohnpei. He reminded the audience that though he is from Sokehs where the Sokehs rebellion and subsequent executions took place, he has a German last name. Senior Pastor Bethwel Henry, of the Kepinle Protestant Church, and one of the FSM’s Founding Fathers gave the opening prayer. Acting Kolonia Town Mayor Vitus Susaia gave opening remarks. Delihna Ehmes, History Professor at the College of Micronesia FSM, spoke on the importance of history as a lesson for the future. One of her students, Cynthia Fredrick also spoke in a quiet voice on the same topic but it was difficult to hear what she had to say. First Secretary Thorsten Gottfried, Cultural Affairs, The Embassy of the Federated Republic of Germany, Manila also spoke to the crowd. He sensitively talked about the importance of remembering saying that what has been done cannot be undone but should always be remembered. Before being seated, he additionally provided a brand new, powerful weed eater for general maintenance. Governor Marcelo Peterson thanked the German government for support of the restoration of the two historic sites before Augustine Kohler gave his closing remarks. The cost of the project was $5,500. More work was able to be done for that amount of money due in part to the logistics service of the Rotary Club of Pohnpei. 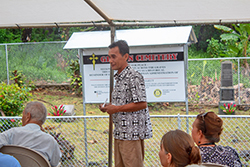 After the ceremony, guests walked through the cemetery to view the more than 100 year old grave sites of German citizens who died in Pohnpei during the German Administration which was from 1899 to 1914. Global Handwashing Day celebrated in Pohnpei for the first time. Pohnpei, Federated States of Micronesia– Global Handwashing Day was celebrated at the Pohnpei Governor’s office conference Room on October 19, 2018. The day culminates celebrations, events, and other advocacy campaigns in the country . The event is spearheaded by the Department of Health and Social Affairs with support from Department of Education; Environmental Protection Agency; Micronesian Productions and UNICEF. Health and Environment champions from Kolonia and Ohmine Central schools all partcipated in the event and provided special numbers to advocate for handwashing with soap to make everyone healthy. The children made a call for government to promote simple and effective habits ane be made available to children especially in schools to reduce the alarming rate of under 5 mortality in the country. According to UNICEF, FSM ranks the 3rd highest in the Pacific in terms of under 5 deaths. Simple habit of handwashing with soap especially during preparation of food and before meal can significantly reduce these deaths. In 2017, more than 500 million people promoted the simple, life-saving act of handwashing with soap on Global Handwashing Day. The day was founded by the Global Handwashing Partnership in 2008 to help communities, advocates, and leaders spread the word about handwashing with soap. Hands are the leading carriers of germs that cause diarrhea and respiratory infections like pneumonia. Handwashing at critical times – such as before a meal or after using the toilet – stops the spread of disease-causing germs. Consistent handwashing with soap reduces the incidence of diarrhea by nearly half and respiratory infections by 25% among children under 5. Handwashing with soap is a simple, but critical, way to ensure overall health. This year’s Global Handwashing Day theme, “Clean Hands – a recipe for health,” emphasizes the linkages between handwashing and food. Handwashing is an important part of keeping food safe, preventing diseases, and helping children grow strong. Yet, handwashing is not practiced as consistently or as thoroughly as it should be. Diarrheal disease limits the body’s ability to absorb nutrition from food and is a major cause of death in low resource settings. Handwashing with soap is an effective way to prevent these losses. Critical food-related times for handwashing with soap include: before cooking or preparing food, before eating, and before feeding someone (including breastfeeding). The contamination of food can lead to a wide range of illnesses and outbreaks, many of which are particularly dangerous for young children and people with compromised immune systems. Global Handwashing Day raises awareness of the importance of handwashing and encourages action to promote and sustain handwashing habits. Organizations and individuals can celebrate Global Handwashing Day by planning an event, participating in a digital campaign, or simply spreading the word about the importance of handwashing. Geneva—With catastrophic climate change threatening to hit many parts of the world in just over a decade, 149 national parliaments have adopted an emergency resolution calling for decisive action. Concluding the 139th Assembly of the Inter-Parliamentary Union (IPU), the resolution, called Climate change – Let us not cross the line, follows the report published last week by the UN Intergovernmental Panel on Climate Change (IPCC). According to the IPCC report, limiting global warming to 1.5°C requires urgent and unprecedented changes in all aspects of society. The emergency resolution was adopted in the context of the Assembly’s umbrella theme of science, technology and innovation to bridge the widening gap between policy-making and science. Led by a coalition of Small Island Developing States (SIDS), the IPU resolution urges all parliaments to spearhead national efforts to combat climate change. It calls for IPU member parliaments to support the implementation of the 2016 Paris Agreement, included mobilizing resources and simplifying procedures for accessing climate change funding. The resolution calls for all countries to work more closely with SIDS to meet ambitious targets to mitigate the worst effects of climate change. SIDS face major and specific challenges in the next few years. MPs at the IPU Assembly presented various examples of climate change that are already affecting the lives of the people they represent. Villages are being relocated because of rising sea levels in Fiji and other small Pacific island states; scarcity of water and desertification are threatening the well-being and survival of many in Africa and the Middle East. Special guest, Henk Rogers, Founder of the Blue Planet Foundation in Hawaii, spoke of the power of children to change the way we live by influencing their families and communities. He also emphasized the importance of strong partnerships. For example, Hawaii has passed legislation to encourage clean energy in partnership with electricity companies. For many years, the IPU has been calling for legislative action on climate change and risk reduction. Since 2009, it has organized parliamentary meetings at each Global Conference of the Parties to the United Nations Convention on Climate Change (COPs) to increase the parliamentary contribution to global negotiations. With the adoption of this emergency resolution, the IPU will mobilize its member parliaments at the COP24 taking place in Krakow, Poland, later this year. The 139th IPU Assembly brought together over 1500 delegates including 56 Speakers of Parliament, 52 Deputy Speakers, and over 750 MPs. Women MPs accounted for 33% of the total number of MPs in attendance, one of the highest percentages at an IPU Assembly. Young MPs under 45 made up 19% of the parliamentarians, the first time that the IPU is tracking this statistic. Chuuk—During a ceremony at the Chuuk Transportation and Public Works office, Ambassador Ryoichi Horie turned over the keys to a new street sweeper to Chuuk government officials. The ceremony was held on September 25, 2018. The street sweeper was provided to Chuuk under an Economic and Social Development Program (FY2015) grant from the Japanese government. The provided equipment will be used for cleaning up the roads in Chuuk State. In his address, His Excellency Ryoichi Horie, the Ambassador of Japan stated that the street sweeper would profit the people of Chuuk through the improvement of road conditions. He encouraged the department staff to conduct proper care and maintenance in order for the equipment to last as long as possible. Mr. Tos Nakayama, Director of Transportation and Public Works, acknowledged the generous grant and the variety of continuous support of Japan to the FSM. He also emphasized that the provided equipment would maintain the cleanliness of the roads. The ceremony was witnessed by the staff of Chuuk State Government, the Chuuk Transportation and Public Works and the Embassy of Japan. Federated States of Micronesia—The FSM Department of Transportation, Communications, and Infrastructure (DTC&I) has released its preliminary report on the crash into the lagoon of Air Niugini Flight PX 073. The report represents no more than a statement of facts as they are known at this time with no analysis or conclusions drawn. FSM Investigator in Charge, Master Halbert says that a conclusive report will be issued one year from the date of the crash. The preliminary report lists the agencies that have been involved in the investigation including investigators from the Papua New Guinea Accident Investigation Commission, the US National Transportation Safety Board, the Federal Aviation Administration, and Boeing. Technical advisers from the US National Weather Service are assisting the US Accredited Representative. The DTC&I is responsible for the “no-blame” safety investigation. The preliminary report is based on the investigation carried out by DTC&I at the date of its publication. It contains factual information, and safety actions taken and proposed. The report discusses the factual history of the flight. “On Friday 28 September 2018, a Boeing 737-8BK aircraft, registered P2-PXE, was being operated by Air Niugini Limited, on a scheduled passenger flight from Pohnpei to Chuuk, Federated States of Micronesia. 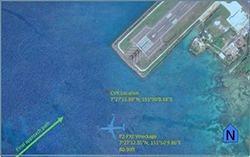 “At 23:45 UTC1 (09:45 local time) the aircraft impacted the water of Chuuk Lagoon about 1,500 ft (460 m) short of the runway 04 threshold, during its approach to runway 04 at Chuuk International Airport. As the aircraft settled in the water, it turned clockwise through 210 degrees and drifted 460 ft (140 m) south east of the runway 04 extended centreline, with the nose of the aircraft pointing about 265 deg. “There were 12 crew members and 35 passengers on board. Six passengers were seriously injured, and one passenger was fatally injured. The report lists one fatal injury, six serious injuries, and the rest as minor or nil among the 47 souls who were aboard the plane. It provided a diagram showing where each passenger was assigned to have been seated and what classification of injuries they sustained.